Frank O’Brien served in Vietnam as an Australian soldier/linguist in 1969/70. He ventured back 20 years later, visiting Ha Noi then flying south to see Ho Chi Minh City (Sai Gon) ...it was another world. 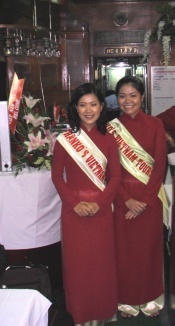 Later, in 1992, he travelled aboard Dorothy Button’s inaugural "Train Tour of Vietnam" from Sai Gon to Ha Noi and knew immediately that the privately chartered train held all the advantages over car/coach/plane that he experienced in 1989 ....everyone could relax, move about freely, AND see the countryside on both sides of the train. It was fantastic! The train was pretty basic back in those days but it was comfortable, private and secure. Reading a book, having a beer/wine/coffee, a meal, a game of cards, a sleep or simply observing & photographing the ever-changing scenes ...all loved it. Today it’s even better ...FRANKO’S Sleeper Car(s) are fully air-conditioned with double glazed windows, western toilets & wash rooms, soft bedding, daily fresh bed linen & towels, and 240V power points in each compartment . The private Dining Car offers great views on both sides of the track, and becomes your place to relax, enjoy a drink, a snack or join a party. There’s a Bar, service staff, soft cafe seating, complimentary fruit & snacks and a DVD/TV/Music entertainment system. There's just no better way to travel in Vietnam! FRANKO’S Superior Class Rail accommodation provides the option of a four berth Sleeper Cabin to every two persons on tour ...More room, More privacy, More comfort. Standard Class can be 3, or up to 4 persons per Sleeper Cabin ...perfect for a family group or those who know each other well! The Sleeper Car provides a room and bed on 5 overnight legs between stop-over hotels on tour, and the Dining Car is our place to relax and socialise. By coupling to the very front or rear of our line of carriages we can physically restrict any entry into or through our exclusive carriages by other rail travellers ...but, if so desired, our clients can walk though the entire train to meet the locals. In this wonderful atmosphere all of our past tour groups have bonded together quickly ...they get to know each other! The feedback from every tour is the same: clients really liked loved the nights on the train, because they were able to fully relax and enjoy the company and experiences of fellow travellers ...and the entertainment! The rail journey itself follows the coast of the South China Sea linking Saigon to Hanoi ( "Reunification Railroad") and is regarded as one of the most scenic and interesting train routes in the world. Completed between 1898-1936, subsequent years of war (1938 until April 1975) and economic depression in Vietnam (1980s) denied the railroad exposure to any form of rail-tourism ...hence no such thing as a "rail tour by private charter" was developed before 1991. Today FRANKO'S rail tours extend beyond Hanoi, following the banks of the Red River up to the Chinese Border and NW mountain resort town of SaPa. The entire rail tour is a very smooth run of around 2500KM. Generally the standard of rail travel in Vietnam (including 1st Class) is below that expected by discerning Western tourists. That’s where FRANKO’S come in - our private rail cars are prepared and customised to provide the highest standard of rail travel available in Vietnam ...that’s our specialty! Additionally, our friendly railway staff are dedicated to ensuring client comfort, security, safety, and enjoyment for every moment aboard a FRANKO’S train. The same crew/staff remain with our rail cars throughout each tour - they become our Vietnamese mates ...no request is too hard, and they know what the term "cold drink" means to an Australian, Kiwi or South African. Cold! Our private carriages and rail staff stay with us throughout the tour. Upon reaching each of the various stop-over destinations (Nha Trang, Da Nang, Hue, Hanoi, etc.) our private sleeping & dining cars are disconnected and moved to a siding and secured to await our return in a day or two. In all, we spend 5 nights and 2 afternoons aboard the train: Saigon-NhaTrang (1), NhaTrang-Da Nang (1), Da Nang-Hue (4hrs by day), Hue-Hanoi (1), Hanoi-Sa Pa (1), then Sa Pa-Hanoi (1). The train allows us to arrive at each hotel on tour feeling fresh & rested and ready to enjoy the local attractions - sure beats having to endure a long bus ride on the dangerous roads, or wasting time with city traffic and multiple airport procedures (there are better things to do!). We simply board the train on 5 different overnight travel legs, have a beer, a party, a cuppa, etc, then get a good night’s sleep before morning arrival at a new hotel in a new region. In effect, by sleeping as we travel between different destinations on tour, we gain at least 2 extra days on site compared to other Vietnam tour groups who fly between destinations. Our gain increases to at least 4 extra days when compared to tour groups who travel by road. 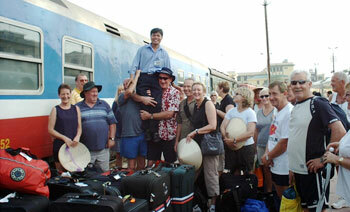 The rail tour schedule allows FRANKO’S to maximise the time available at each major destination on the Tour Itinerary. No small advantage - we really see much more! FRANKO’S Tours visit ALL the "main attractions" that Vietnam has to offer ...and then some (eg. we include both Sa Pa and 24 hr cruise on Ha Long Bay). Every stage of the tour; every hotel, restaurant, tour guide and mode of transport has been fully endorsed by previous tour clients. We stay at good 4 Star hotels (w/late check-outs), dine at the best restaurants, enjoy superb entertainment (dinner show most evenings) and travel everywhere in air-conditioned comfort (tour coach/train/junk). Compare other means (car-bus-plane) and there’s no comparison! Compare FRANKO’S customised, exclusive rail car arrangements to the cramped, shared accommodation encountered on Vietnam Rail’s 1st Class ...same result! The train is the KEY to a great holiday - you see much more! means that we know what we're doing - and we aim to please! ...and the very best way to see Vietnam! Our Rail Crew - smoothies!